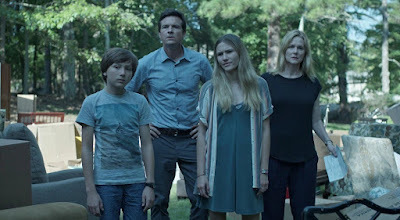 In the first episode of Ozark, Marty Byrde (Jason Bateman) is in a kind of existential midlife funk: His wife, Wendy (Laura Linney), is cheating on him; his kids are growing into entitled nightmares; and his job as a financial adviser appears to be lamentably unfulfilling. Then, suddenly, the show flips everything on its head. Marty’s business partner has apparently been stealing millions from a Mexican drug lord and is murdered in front of him. Marty’s only recourse is to plead for his life and propose a new plan—he’ll launder $500 million in drug money by moving to the Lake of the Ozarks, a man-made reservoir in Missouri and a popular holiday destination that he argues will be less conspicuous to the FBI.